Bring back the original shine on dull stainless trim pieces with this kit. 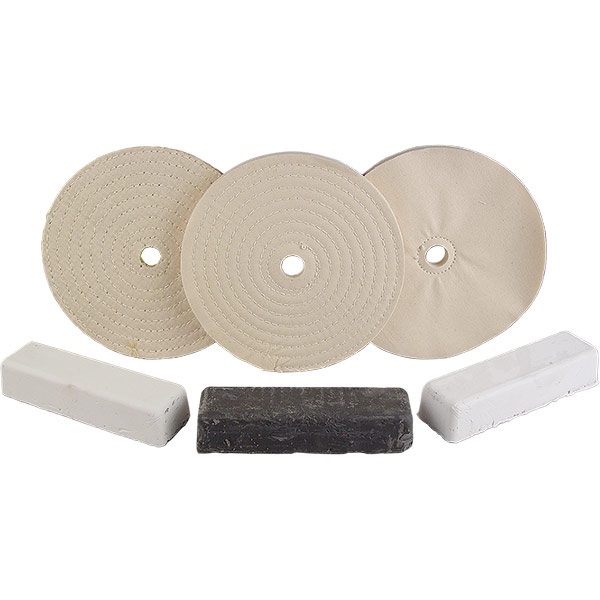 Includes: one sisal buffing wheel and one 20 oz Emery Compound for deep scratch removal, one spiral buffing wheel and one 20 oz Stainless Compound for cutting and coloring, and one loose wheel and one 20 oz White Rouge for final polishing. Made in USA. 6" diameter wheels. Fits 1/2"-5/8" arbor hole. For 1/3 HP Buffers. 1/2" thick, 40-ply. Made in USA. 8" diameter wheels. Fits 3/4"-7/8" arbor hole. For 3/4 HP Buffers. 1/2" thick, 40-ply. Made in USA. 10" diameter wheels. Fits 3/4"-7/8" arbor hole. For 1-1/2 HP Buffers. 1/2" thick, 40-ply. Made in USA. Using this kit to restore stainless steal trim for a 57 Chevy, lots of trim, during the first minute of use, the sisal pad came apart, literally, pieces of string broke out of the pad, it was like the pad string was dry rotted, terrible quality! The spiral and loose pads are ok, no issues with them. The compounds work good also.